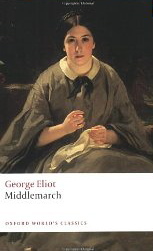 George Eliot’s epi c novel MIDDLEMARCH, often considered her masterwork, portrays life in an English Midlands community from the point of view of several main characters and the people with whom they interact. While developing characters and plots, however, she also illustrates a variety of themes related to the social milieu of the early 1830s. Dorothea Brooke, the main character, is a bit rebellious, in the sense that she wants to do something with her life, not just be the typical upper-class wife of her period. For this reason, she rejects an early suitor in favor of Edward Casaubon, a man more that twenty years her senior, who has devoted his life to arcane scholarship. Anxious to participate in his intellectual pursuits, she hopes to help him organize his research toward the publication of a book. Self-important and pontifical, he, however, sees Dorothea as far beneath him intellectually, more a scribe than a partner in his work, and she realizes on her honeymoon that she has made a mistake in her assessment of his character. His unemployed nephew Will Ladislaw, whom he is supporting, shares some of Dorothea’s values, and Casaubon becomes insanely jealous of any contact between them, noticing Will’s attention toward Dorothea when Will meets them in Rome during their honeymoon. In another plot line, Tertius Lydgate, the scion of a wealthy family, is fascinated by medicine, and his decision to become a Middlemarch physician and researcher into new medical procedures, is regarded by his family and others as a step down socially, however altruistic his goals are. His marriage to the Mayor’s daughter, Rosamond Vincy, a gorgeous but shallow flirt, proves to be less than ideal–each has misunderstood the other at the most basic level, and Lydgate’s inability to provide adequate financial support for Rosamond’s inflated visions of married life add to the problems. Rosamond’s brother Freddy, a ne’er-do-well whose family has, ironically, educated him for the church, reflects the temptations of the age–gambling, horse-trading, and the search for easy money. Constantly in debt and always borrowing from family and friends, Freddy hopes one day to marry his childhood sweetheart, the poor but noble Mary Garth. A third plot line involves the town’s banker, Nicholas Bulstrode, a blustery man of uncertain ethics but loud religious proclamations. Bulstrode, married to Rosamond Vincy’s Aunt Harriet, has a past that he is desperate to keep hidden, especially from his wife and her family, and the arrival of a blackmailer complicates his life and adds great drama, while also connecting the several plot lines. 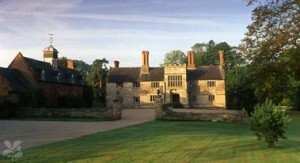 Numerous peripheral ch aracters add to the portrait Eliot creates of several levels of provincial society and their lives. All are consumed with money (or imprisoned by it), since the society is based on class and the ability to live up to class standards. The poor are just trying to earn enough to stay alive. Truly good people, those who “love their neighbors as themselves” and are willing to sacrifice for them, are rare here, and they are even more rarely involved with the church, which was often considered an appropriate profession for the sons of upperclass families who would not inherit enough to live up to their class. None of the marriages here are ideal, and most are much less than that–seeming more like mergers, than real marriages. Few men or women are concerned with the education of women or envision any role they might play other than as keepers of the hearth. Most of the characters, in fact, have so little focus beyond themselves that they do not even seem to realize that other characters, including their spouses may have dreams and desires, too. People are judged by the degree to which they adhere to the social norms, rather than by any insight into their characters. Psychology was not yet a concern, and Freud’s research was still thirty years away from fruition. Though Eliot was describing life in the early 1830s, she wrote this novel in 1871 – 1872, using the perspective of distance to provide insights into life during the earlier period. Always concerned with social issues, especially those involving women, Eliot creates fascinating characters, especially Dorothea, the talented and intelligent woman who wanted more intellectual stimulation than she was able to find as an upperclass woman in the 1830s. Eliot herself often challenged the status quo, shocking her society by li ving openly for many years with a married man, George Henry Lewes. Before her death, she shocked again by marrying a man twenty years her junior. She found it necessary to use a man’s name throughout her career as a novelist, not her real name of Mary Anne Evans, to promote the publication and sale of her work as “serious” novels. MIDDLEMARCH, originally published in eight separate volumes, is an enormous novel with a scope as epic as its length. The author clearly is clearly aware of the changes in the 1830s which have affected the society in which she lives in the 1870s. It is not until 1876, however, that Eliot will write a novel about her own times and society, resulting in the novel DANIEL DERONDA, lesser known, perhaps, but one that many readers (including me) consider her crowning achievement, a work which takes the novel in new directions. 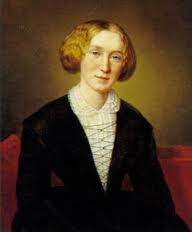 Notes: The portrait of George Eliot when she was thirty, is by the Swiss artist Alexandre Louis François. 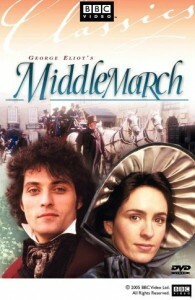 In 1994, the BBC produced a miniseries of Middlemarch, starring Juliet Aubrey as Dorothea, and Rufus Sewell as Ladislaw.